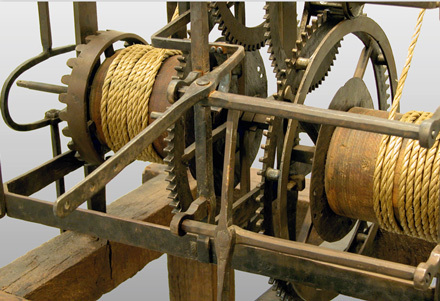 Probably built around 1675, this tower clock mechanism was acquired at auction by noted horologist and collector Donald Saff. It had been modified and rebuilt several times. Don Saff wanted it returned to it's original configuration. Several missing pieces had to be reconstructed. Don and his assistant, Ken Elliott, experimented with prototype pieces to determine their sizes and shapes necessary for correct functionality. Lee Badger reproduced the prototypes in forged iron to match the original construction and craftsmanship of the clock. 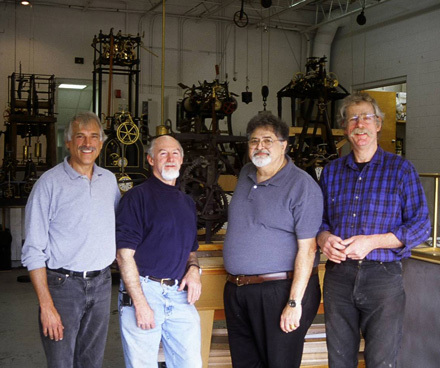 The restoration of the clock to original working condition was the subject of a paper and presentation to The Objects Specialty Group of the American Institute for Conservation of Historic and Artistic Works at the 34th Annual Meeting, in Providence, RI in 2006.